This article is about the commercial digital systems I use. The MRC Command 2000 and the Piko-digi1. 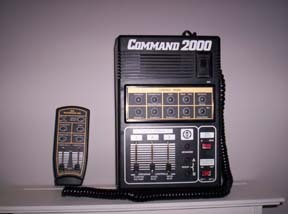 The MRC Command 2000. This is what got me to go digital. 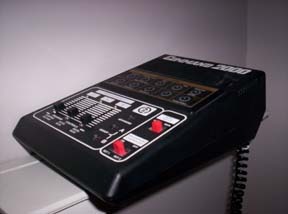 At the left is the optional handheld controller. 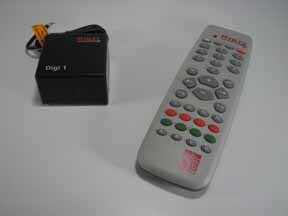 With this system, as pictured, you can control up to 10 trains, even 1 without a decoder. Of course it only has a minimum of functions, which were not available in decoders at that time I guess. Programming the decoders and operating the layout is done all in one unit. All this is done with switches with double functions. Not easily done without the manual. Viewing the computer screen with the computer system running MRdirect used on my layout, it is a lot easier. If available, click on the picture for a high resolution picture. 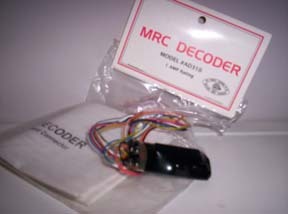 MRC decoders as used on my layout, I got them cheap from a co-worker.